Endowance has developed a unique approach for Field Service teams to address this challenge. Standard Field Service Processes manage the tasks, but the Endowance approach addresses how to prioritize the job based on parts availability, not only the job itself. The Field Service process starts with a customer request. The Contact Center representative receives an inbound request, creates a Work Order and then books an appointment from the Service Console. Once this is completed, the Dispatcher can create and manage jobs for the available technicians. The job schedule can be optimized based on several variables, including technician skills, routing, availability, location and more. The field technician is a mobile user, and will use a mobile device to manage any assigned jobs, notify the dispatcher and /or customer. 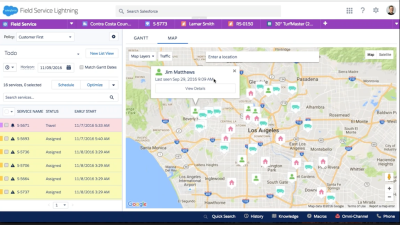 Scheduled Jobs are available on the technician’s mobile device, with the schedule being optimized throughout the work day, based on changing circumstances like a job takes too long, or a field technician becomes ill.
One of the key benefits of implementing Field Service Lightning is to optimize inventory and complex assets/parts, next to optimizing utilization. Many companies maintain a huge inventory to repair customer assets and are challenged to manage the associated cost. The triage process (conducted by a seasoned professional, and meant to do an in-depth analysis of the issue) is key to the success of a Field Service initiative. The cost associated to sending out many parts has a major impact on the overall cost to fixing a customer issue. The more accurate an issue can be diagnosed the fewer parts are required for the job. Technicians are on the road many hours per week. They drive from customer to customer, and spend a lot of time in the car. This time can be managed more effectively, by taking in account parameters to limit driving time and schedule jobs that are close to each other. The goal is to complete as many jobs as possible during a work day. Technicians can update the status of a job with a simple touch of a button, so the dispatcher stays informed on the progress of a job. The location of a technician can be monitored at any time, making sure the Field Service Management team is up-to-date on where the workforce is throughout the working day.